At some point, associations with private streets and parking areas confront the question of whether towing and/or vehicle immobilization is the appropriate solution to parking problems within their community. In order to have the authority to tow or boot a vehicle, the Association must not only have the contractual authority to do so, but the towing or booting of vehicles must also comply with Arizona statutes. Arizona statutes require the Association to adopt signage that would notify visitors and residents of the possibility that their vehicles may be towed or booted if parked in violation of the Association’s CC&Rs and Rules. Disposition of vehicles found in violation of the parking restrictions. Maximum cost to the violator, including storage fees and any other charges that could result from the disposition of a vehicle parked in violation of parking restrictions. Telephone number and address where the violator can locate the violator’s vehicle. Although this statute is commonly regarded as a “towing” statute the language is broad enough to encompass both towing and vehicle immobilization. The purpose of the statute is to provide the public with fair notice about the expectations of the property owner with regard to parking restrictions. Residents of the community are arguably on record and actual notice of the rules. Therefore, a blanket statement on a sign such as, “vehicles parked in violation of the CC&Rs are subject to towing and/or booting” may be sufficient for them. However, visitors with whom an Association lacks a contractual relationship are generally without notice regarding the parking restrictions in the community and may argue that such a statement does not provide enough notice regarding parking restrictions to satisfy the statute. Associations with authority to tow and/or boot improperly parked vehicles should ensure that their signage gives fair notice to visitors regarding the types of violations (e.g. parking in spaces not designated for visitors, parking in fire lanes, etc.) 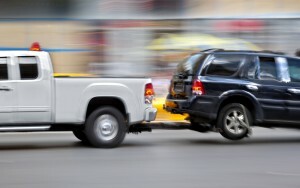 that could result in towing or vehicle immobilization, and how to retrieve or free their vehicle if action is taken. We recommend that associations consult with counsel to see if the signage is adequate. If you have further questions, please contact Carrie Smith or another attorney in the firm.